The Huawei Honor 3C has been specially designed to fulfill all the aspirations that you can have from a smartphone. To make it possible, every feature of the phone has been enhanced – bigger screen, a better processor, a better camera and a stronger battery. In doing so, the elegance and aesthetics have been kept intact so that you can make a style statement with your Honor 3C. The 12.7 CM (5”) HD LCD Screen of the Honor 3C gives you dynamic and rich colors so that you can enjoy lifelike images and videos. The capacitive screen comes to life at the slightest tap of the finger. This highly responsive and less reflective screen takes your smartphone experience to a new high. The unique round edge design of the phone not only gives it an elegant look, but also makes it more comfortable to hold and experience. The Honor 3C has a screen to body ratio of 69% which makes it an extremely compact smartphone. The upper bezel of 4.5 mm reduces down to 2.2 mm on the side and adds to the compactness of the phone. The Huawei Honor 3C comes with a 1.3 GHz Quad Core processor that takes your smartphone experience to a whole new level. With the power of this advanced processor at your disposal, you become a king of multitasking. The 2 GB RAM of the Honor 3C works wonders in combination with the Quad Cored processor and enhances your smartphone experience manifolds. Whether it is playing online games, downloading and watching videos or sending mails, everything is just a tap away from you. To add beauty to your special moments, we have equipped the Honor 3C with an 8 MP Sony BSI camera. This is not all; the camera also boasts of a Blue Glass Filter that gives you the luxury of choosing the desired hue for your photos. The Voice Photograph function enables you to click amazing photographs by voice command. With a focal length of F2.0, you can easily focus on the detail you want to capture. With the 6 CM Macro View of the camera you can bring amazing clarity and detail in your photographs. The Dual SIM Dual Standby feature of the Huawei Honor 3C helps you to manage your personal and professional worlds in a more efficient way. It also helps you reduce the call rates and optimize the data usage. For those seamless video calls and great selfies, we haveequipped the Honor 3C with 5 MP front facing camera that has 22 mm wide angle lens. It comes with a magic preview window for that perfect click. The panoramic selfie feature allows you to click self portraits with great backdrops. When you have Android 4.2TM on your phone, you not only get the confidence of working on one of the best mobile operating systems but also get more options for apps. Honor 3C gives you the additional benefit of the EmotionUI 2.0 that makes your phone management a cakewalk. It starts your selected applications automatically when you turn the phone on. Besides, your applications get better security through features like harassment filter, permission manager and notification manager. This smartphone will never leave you high and dry during multi-tasking as it comes with a strong 2300 mAh battery. 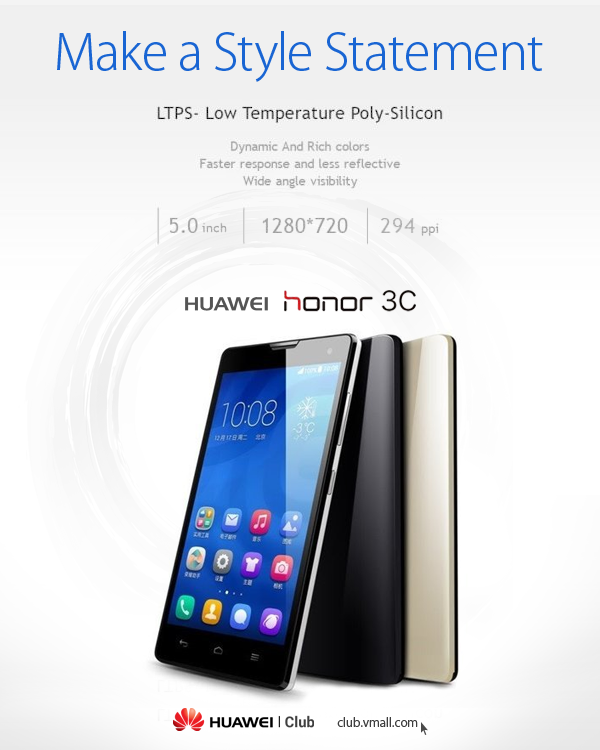 What makes Honor 3C a truly energy efficient smartphone is the Huawei patented power saving technology that uses the power 30% more efficiently than any other phone. This means that you can play more games, have more talk time and above all get more peace of mind.